Justice Department special counsel Robert Mueller may be running out of space to maneuver — or he may not. But the White House is calibrating its strategy as though a clock is ticking. 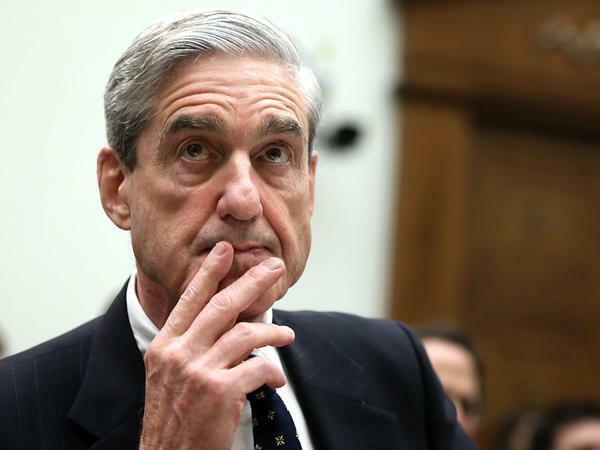 Mueller, they believe, doesn't want to make any major moves or announcements after Labor Day, because he's sensitive to criticism that he might improperly influence the midterm election — in the way critics on all sides faulted former FBI Director James Comey for his handling of the big investigations in 2016. If that's so, Mueller has roughly three weeks to do whatever he's going to do and then — who knows? Simply go quiet until after Election Day? Or wrap up his inquiry altogether? As usual, no one knows except him, and there is no independent statement from Mueller to suggest that he feels bound by any of these expectations. Trump and his attorneys, however, led by former New York Mayor Rudy Giuliani, have taken this as their working hypothesis and are crafting their strategy accordingly. This, for example, was the basis upon which — staying with the chess metaphor — Giuliani responded to Mueller's latest move last week in their months-long middlegame over a prospective Trump interview in the Russia matter. Mueller wants to talk. Yes, Trump wants to talk too, Giuliani told NPR's Ryan Lucas. But only if the special counsel agrees to constrain himself to certain questions and agree not to broach other ones. Mueller's next move isn't clear. Trump is willing to entertain questions about whether he or anyone in Trump's campaign conspired with the Russian attack, Giuliani said — the answer, presumably, will be "no" in the same way it has been all along in public. That, incidentally, also suggests how confident Trump and his camp are that there is nothing to the collusion/conspiracy track of the Russia imbroglio, at least involving the president. The alleged obstruction of justice track is another story. Trump will not address questions about his firing of Comey or his handling of the case of former national security adviser Michael Flynn, Giuliani said. Trump's public explanations in those areas have varied, and Trump's lawyers don't know what other witnesses have told Mueller, so there's a danger of what Giuliani called a "perjury trap." Trump and his supporters say he hasn't done anything wrong, but there's also no way to know what the famously discursive president might say in a high-stakes legal interview. Trump's legal team, for the record, also argues that it is effectively impossible for Trump to commit the crime of obstruction of justice, given his powers under the Constitution. And even if he had, Trump argues, he can pardon himself, so any notional enforcement action is moot. That is not a consensus position in Washington, but these are uncharted waters. Will Mueller agree with Trump's latest offer? So far no one knows. Mueller does not talk publicly. But Giuliani, who can talk as much as he wants, also can give what he calls Mueller's position, and shade public perceptions of how Mueller is doing or what he intends. Hence the origin of the Labor Day cutoff narrative — is that a real thing? Whether it is or not, the idea is out there now, and Giuliani has created a clock to tick for Mueller's office to consider what Trump considers a generous offer. Mueller, in this construction, can either take the good deal that Trump has outlined — which Trump wants — or spurn these good-faith negotiations — which strengthens Trump's case that Mueller is running a "witch hunt" — or wait for so long that he runs out of time if Labor Day passes — which Trump wants. The Labor Day cutoff narrative is important for another reason. The Senate is expected to confirm Brett Kavanaugh to become the ninth Supreme Court justice this autumn; Senate Majority Leader Mitch McConnell, R-Ky., says he wants the judge to be on the bench in time for the high court's October term. If all that plays out as Republicans hope, Kavanaugh will be an invaluable ally for Trump if the situation with Mueller turns sour. Picture this: Negotiations between Trump and Mueller break down. Mueller asks a grand jury to subpoena Trump. It does. Trump asks a federal judge to throw out that subpoena. Washington is plunged into a historic test of the power of the chief executive. The case quickly escalates to the nation's highest court. Waiting there for it is presumptive Justice Kavanaugh, helping form a 5-4 conservative majority sympathetic to strong presidential power and Trump. This doesn't mean the Supreme Court would agree that Trump could neutralize a subpoena and ignore Mueller's demand that the president give evidence. But Trump's lawyers say they like their chances. In fact, Giuliani, in discussing this scenario with NPR, said he thought he and the president had better than a "50 percent chance" to win. The bottom line: The White House either wants Mueller to interview Trump under its terms relatively soon or forbear completely until November at the earliest. Not only does it consider this its best political strategy but the delay also may bring about better conditions on the metaphorical battlefield if this tension escalates. None of this is certain. Mueller might decline to follow this path for any number of reasons — he might not observe the Labor Day cutoff philosophy. The Justice Department's practices surrounding elections aren't hard-and-fast rules and Trump's name isn't on the ballot this year. And even if Mueller were to go ultra-quiet, as submariners say, from Sept. 5 to Nov 6, nothing would stop him from surfacing on Nov. 7 in the fountain on the North Lawn, popping out of the hatch and presenting Trump with a subpoena then. Or he might decide that he doesn't need direct evidence from Trump because he's gotten what he wants from elsewhere. Or he might assess that it isn't worth the risks involved with sparking the Constitutional war that could issue from a subpoena fight. Even though Mueller doesn't talk publicly, he retains political leverage over Trump. The president wants to be seen as cooperating — magnanimous even in the face of what he calls an "illegally brought ... rigged Witch Hunt run by people who are totally corrupt and/or conflicted." Trump does not want to crash out with Mueller if he can avoid a situation that makes it look like he is shirking questions — and he does not want to invoke his Fifth Amendment right not to give evidence that might incriminate himself. Trump retains that privilege as would any American under the Constitution, but he and his advisers know the political costs they might have to pay, especially before Election Day. The difficulty in assessing it all — and how Mueller might be willing to use this leverage — is not knowing Mueller's side of the story.